The Quick Heal Threat Research Lab has been detecting increased numbers of ransomware infections over the last few weeks. We have recently reported on the notorious Dridex ransomware. These incidents depict a clear trend that malware authors are steadily shifting to serious money making ransomware variants. Ransomware has proven itself as a highly effective money extortion mechanism over the last year. Ransomware has become much easier to develop due to the availability of source code and the emergence of ‘Ransomware-as-a-service’ products in the black market. Ransomware is increasingly being used along with other successful and penetrative malware propagation techniques such as spam campaigns, ‘Malvertising’ and ‘Social Engineering’. Ransomware has become efficient due to the presence of Bitcoins, a digital currency that enables cybercriminals to collect money anonymously. 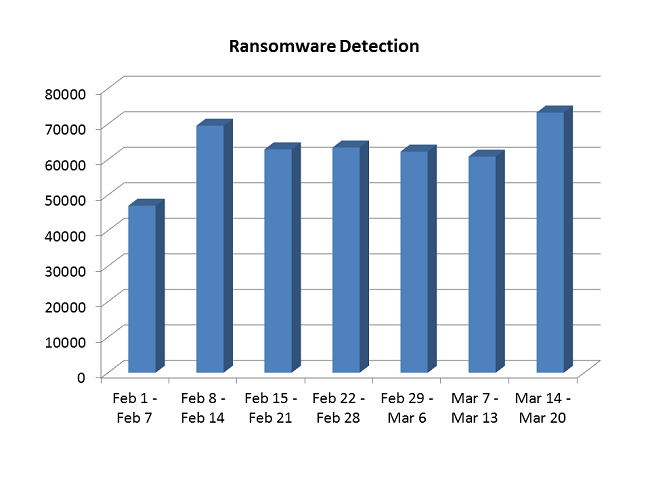 This graph shows the number of ransomware detections by Quick Heal for the 7 weeks starting from February 1st, 2016. In this time period, our lab has detected nearly 450,000 ransomware samples, which work out to approximately 9,000 ransomware detections every single day. These figures present a considerable rise in the ransomware detections that we have seen in the past, and they highlight the growing threat of ransomware to businesses and individual users. There are a few foolproof precautions that need to be undertaken to prevent ransomware variants from infiltrating and locking your machine. These safety guidelines are even more relevant for enterprises and small business owners who are often the most sought after victims of ransomware authors. When it comes to data security, the first step is data classification. It is essential for data owners to segregate their data into crucial, moderate or dispensable categories and then devise ways to secure their most sensitive information. We recommend the 3-2-1 rule – maintain 3 different copies of data, in 2 different formats, with 1 format available offline. Malware developers typically exploit vulnerabilities in applications and the OS to breach system security. To prevent incidences it is highly recommended to automatically download OS updates, and apply regular security patches for other applications on the system. Commonly targeted applications are Java, Adobe Acrobat Reader, Adobe Flash Player, MS Office and web browsers such as Google Chrome, Mozilla Firefox, Internet Explorer and more. Personalize spam settings for your email inbox and your installed security solution. Use the native Windows functionality of ‘Show File Extensions’. This shows the extensions of unknown files before opening them. In case of breaches or infections, immediately disconnect the Internet connection. Keep the Windows Firewall switched on at all times and regularly monitor its settings. Enable your installed security software to scan compressed and archived files when they enter the system. Turn off AutoPlay for USB devices, so that they do not immediately open the files within them. Consider installing an add-on which blocks automatic pop-ups on your browser. Last week i upgraded my QHTS Ver.16 to 17.. Yes, the Quick Heal software on your device is actively blocking ransomware on your machine. However, you must also take all the necessary precautions to prevent ransomware infections. nice update.such infomations are very important. sir, meri drive lagbhag aadhi khali hai phir bhi 0 space dikha raha hai or ajeeb ajeeb tarah ki file dikh rahi hai main kya karu mera data bahut keem ti hai because meri photography ka kaam hai sabhi data important hai plz solution bataiye. please. May we request you to contact our technical support team. They will help you resolve this issue as soon as possible. You can reach them here – http://www.quickheal.co.in/submitticket. These ways of protection are not enough. Can this ransomeware be completely removed from machine by rebooting, and can be repaired by Quick heal total security? Or you have any other option. Ransomware variants are constantly changing and there is no software that can completely block all kinds of ransomware before they are even created. So all security products are reactive in nature to some extent. However, if users undertake some of the precautions mentioned here and also use an effective security solution, then the chances of avoiding ransomware are high. So it is best to remain proactive and alert when it comes to security and not depend on a security solution only. Yes, I trust Quick Heal but I am using Quick Heal Internet Security version 16.00 (9.0.0.54). When I upgrade to it’s latest version version 17.00 (10.0.0.6) it consume more RAM & slow down my PC, increase startup & shutdown time. That’ss why I am using version 16.00 (9.0.0.54) again. Also When start LIVE CHAT on your website, I did’nt received Chat transcript but it show Mail has been sent successfully. I have been purchased on Amazon Quick Heal Total Security-2PCs 1 Year (CD)X000F9YAE1 vide your cash memo No PB-STA-137231171-22172 dated 21 Mar 2016. Please keep update Quick Heal Total Security on my PC till updating the CD on my PC please. Thumbs up to Quick Heal, I will henceforth start introducing and recommending Quick Heal to my friends. Please advise whether we can have Windows Firewall on even when Quickheal antivirus security is running. Yes you definitely can have Windows Firewall ON as well. This is an in-built feature in Microsoft operating systems, and it is an added security layer that should certainly be used in addition to any security software on your device. sir, i am a layman . so it is my request to u to inform us in simple way —what to do n not to. My PC has slow down after instalation of gardian antivirus from quickheal , Why? QH isn’t as effective as MS Security Essentials in detecting and killing ransom virus. Org. like QH should find soln. to unlock files affected by ransom as a service to its reg. users. QH updating is fictional and not practical or real, for QH cannot remove or fight with ..ware effectively and after each update my PC gets slow in operation. Hi i am use quickheal.this is very good choise for my PC.he protect my PC always.this is good. Is QH update necessary every-time or old QH version can prevent virus if we are not connecting the internet. Updates are important because the global virus database gets updated in real-time. Every day there are thousands of new malwares that are created and detected and our database is accordingly updated. So if you miss out on some updates it is essential to get them soon, as your machine may then be infected by a sample that has not been updated in your software. It is udefull to protect my both device mobile & computer. I want more help from this anti-virus. This is useless product when comes to Locky Ransome malware virus which did not even prompt for malware when our server was hacker which had 15years data. We have been using this product for 7-8 years with regular updates and timely activation done for 3yrs. There customer support is never reachable as we need to wait for 50-60 mins but no one will come on line. If any tech comes online they simply do not understand the issue and say we are helpless. THIS IS USELESS PRODUCT, NO SUPPORT, WASTE OF MONEY. THEY ARE THE BIGEST HACKERS WHITHOUT PROVDING SUPPORT. We understand your displeasure as a customer. There could be more than one reason behind this incident. We have shared your concern with the team and they will get back to you soon. Which Quick Heal product are you using? This has given me a good start on learning to fight and prevent Ransomware infection. Thanks! I’m impressed with what I have seen and read so far. Our support engineers would gladly help you with this issue. Please visit http://bit.ly/QHChat to chat with us online. You can also raise a ticket at http://bit.ly/Askus and we will get back to you at the earliest. Please explain your query in detail so that we can assist you. Thanks a lot for this important message. Keep it up God Bless. How i mainten my device from mailware . Thanks for writing in. Our support engineers would gladly help you with this issue. Please visit http://bit.ly/QHChat to chat with us online. You can also raise a ticket at http://bit.ly/Askus and we will get back to you at the earliest. Thanks for writing in. Our support engineers would be able to answer your query in detail. Please visit http://bit.ly/QHChat to chat with us online. You can also raise a ticket at http://bit.ly/Askus and we will get back to you at the earliest. I have encountered the same Virus Encryption Problem with RSA-4096 and my all documents are corrupted. Anyhow, I removed the Virus completely by Quick Heal Pro, so there are no viruses now but my files are still encrypted. Could you suggest me how to decrypt the files? I tried Recuva, Shadow Explorer but nothing helped me. It is very urgent for me. Thanks for writing in. Unfortunately, files encrypted by a Ransomware are almost impossible to get back or decrypt without paying to the hacker. It also depends on the grade of encryption used. However, we’d request you to have a word with our support team; they would like to analyze the issue. Please visit http://bit.ly/QHChat to chat with us online. You can also raise a ticket at http://bit.ly/Askus and we will get back to you at the earliest. hi , i am renewed quick heal software on my pc on 04/04/2016 but it has been frequently show that product key cannot be renewed .the provide product key is renewed within 10 days. tell me sir, how can i solve this problem ? How i use it on my Laptop & Mobile device same time? One Quick Heal product can be used on one system at one time. Please let us know if you have any queries. Its not a new problem i have faced it in 2010 when i install a suspicious netbooster and at that time quickheal total security also failed to save my computer from that infection at last i went for windows format process to get rid of that ransomware. We are regretful to learn about your unpleasant experience. We’d like to assure you that our products are more capable and advanced than before when it comes to countering ransomware attacks. Do let us know if you have any queries. Some day before updates were workingand after that stoped. Maine apne phone ko kingroot app se root kiya huaa hai. Nd phobe ko quic heal se scan karne per kingroot app ko threats show karta hai. Then kya sach me kingroot app threats hai. Thanks for writing in. Our support engineers would be able to assist you in this matter. Please visit http://bit.ly/QHChat to chat with us online. You can also raise a ticket at http://bit.ly/Askus and we will get back to you at the earliest. I just share with you as per last week my all data is covered locky file and i have donload quick heal antivirus . After scan all file then detected locky file rensomware errors please suggest how to remove locky file virus so that we recover my ms word , excel files or PDF . Sir, I have quick heal pro installed on my laptop, yet it recently got infected by a ransomware, which encrypted all my office and pdf files. Now I am not able to access those files as their file type has been changed to CRYPT. I formatted my laptop last month and unfortunately did not take a backup since then. Tried to recover files via system storage but it didn’t work. I would highly appreciate it if you could suggest me with some solution which could help make those files usable again. 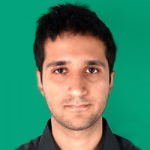 Dear sir..I like these antivirus..
Hi Saurabh, Thanks for writing in. Our support engineers would gladly help you with this issue. Please visit http://bit.ly/QHChat to chat with us online. You can also raise a ticket at http://bit.ly/Askus and we will get back to you at the earliest. Are users of Quickheal anti-virus protected from the attack of Ransomware. Please provide some tips for us to check whether there is any chance of breach of security and to take steps to overcome the same. Eg., those who have adopted Quickheal anti-virus may not have the anti-malware and it may affect the PC. Yes, Quick Heal users are protected from Ransomware attacks. You can follow the tips mentioned in this post. frequently my system is damaged by some antivirus. Why is it software is not detect and remove those wireses? BU8CE4GE1R2720812B10. kindly quick active from you . We’ve shared your concern with our team. They will get in touch with you shortly. How to remove Malware from this PC ? Many time scaned but it does’t go. The Malware name is $RECYCLE.BIN and System volume Information. Thanks for writing in. Our support engineers would gladly help you with this issue. ou can also raise a ticket at http://bit.ly/Askus and we will get back to you at the earliest. bakwas antivirus, only useless, 1000 gb data has been lost, make av more effective. Thanks for writing in. We have shared your feedback with our team so that they can look into the matter. In the meantime, you can visit http://bit.ly/QHChat to chat with us online; our support engineers would gladly help you with any issue that you might be facing.